After high school, he trained as an engineer. For Olle Enderlein, boat designing was a hobby that gradually became his profession. When he was 27 years old he left his position at Archimedes engine factory in Gothenburg to try to become a professional boat designer. According to him, ”he stopped working”. Boat designing was much more like a way of life than an occupation. He was a reserved person and he rarely made public statements. His designs were his means of communication. He was as much an artist as he was a constructor. He was a born aesthete. 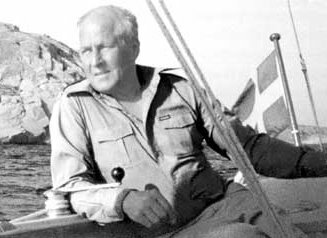 Enderlein kept and developed an interest in boats and boat construction for his whole life and he himself designed a couple of hundred different boat models – an unbeatable record. The blueprint archives are comprised of a hundred or so designs. The inventory covers a wide range – from small canoes and skiffs up to the Hallberg-Rassy boats HR 35 ”Rasmus”, HR 352, 38 and 382, the ketch HR 41 together with the HR 42, 45 and 49. In the register, spanning these designs, is a whole row of perhaps his most loved designs. Among these, of course, belong the ”OE-boats” (OE 32, OE 36 and others) but also the motor sailers Monsun 31 and Najad 34 as well as the sailing boats Misil, Mistral, HR 26, HR 312, Nord 80, Shipman 28, Mistress 32 and several others. Many of these boats are still sailing today. Mankind has sailed since the beginning of time. They have sailed both to earn a living and for pleasure. Even the specialised form of pleasure sailing called yacht racing is an old sport. The sport began in England in the 18th century and eventually came to Sweden, where The Swedish Yacht Club was established in 1830. When King Oscar II joined the association, the name was changed to The Royal Swedish Yacht Club, KSSS, and adopted the three-tailed flag. In order to correct the imbalance in the development of designs, in 1923 The Swedish Cruising Club was established, which instead wanted promote long distance sailing and what was called ”cruising”. This demanded another type of boat – more sea-worthy and comfort able for longer regular sailing trips with ”ordinary” people as crew, i.e. ”family boats”. Olle Enderlein was six years old when The Swedish Cruising Club was established. At this age he was already passionate about boats and consequently he found himself at the starting point in the development of a whole new way of thinking about boats which would soon take off and quickly advance. He came to make a lasting contribution to that development. At an early stage, Yacht Racing had drawn up different match rules for different types of boats so that they would be able to compete with each other in a fair and just way. In addition, RORC (Royal Ocean Racing Club) regulations had been drawn up earlier and remained unchanged from 1931 until 1970. They were replaced by the IOR (International Offshore Rules) regulations. These were worked out by a committee with support from, among others, Olle Enderlein. The first ocean yacht race was arranged in the USA around the turn of the century. It was much later, in the1920’s, that the big ocean yacht races – like the Fastnet Race – began. Ocean yacht racing came to Sweden in the 1930’s. KSSS represented them, while The Cruising Club was mostly concerned with long distance sailing. But there was no antagonism between the two clubs. One reason for that was, among others, that the Swedes were not particularly interested in extreme racing yachts. Instead, they wanted seaworthy family boats of a moderate size which could also be used for yacht racing. KSSS and The Cruising Club were therefore jointly interested in developing such boats. Olle Enderlein came to play an important role in this development work. Enderlein’s ideas had since the 1940’s influenced the public perception about how boats should be designed. In 1944 Enderlein won – in a competition against 18 other constructors – first prize in The Cruising Club’s competition with a boat that could be built with three different stern designs. The design was called “Gudingen” (Swedish for the the male eider duck) and the first prize was 900 Swedish crowns (about 100 euro). Enderlein even took a couple of honourable third placings in English design competitions and he realised that the hobby of designing would perhaps lead to a working trade. In 1947 he was convinced that this would be the case. Then he won the first prize in the magazine Yachting World’s big international design contest, in competition with 48 established constructors from the major sailing countries. The winning design was a 35 foot long distance sailing boat. ”A beautiful boat and a superb sailer” summed up the competition’s judges. As well as the honour, Enderlein received £50 in prize money. In the 1950’s Enderlein became increasingly noticed as a designer in the Swedish and German newspapers and magazines and he became in great demand as a constructor. In 1955 he was awarded the KSSS´ Gold Medal and in 1961 The Cruising Club’s Tore Herlin Medal for his boat designs. At the end of the 1960’s The Swedish Cruising Club discussed how an ideal long distance boat should be designed. Few of the designing customs of the day met the criteria they wanted from such a boat. The Cruising Club therefore turned to three designers to gather their knowledge for further discussions. One of these three was Olle Enderlein. The OE-boats formed some of the boat models that Enderlein designed in the 1960’s and later. They are each different but they all have been influenced by the discussions that The Cruising Club initiated in the 1960’s.